Ocean and garden views close to the pool. Enjoy beautiful sunsets every evening from your private lanai in this beautifully updated third floor unit! This one bedroom (plus sleeper sofa), two bath, 818 square foot condo is ideal for families or for couples. Both bathrooms have been remodeled with maple and granite vanities. There is a new shower and tile in the hall bathroom and new tub and tile in the master bathroom. The bedroom has a king size bed and flatscreen television mounted on the wall for your enjoyment. Your extra guests can enjoy the luxury of a sleeper sofa with a six inch mattress. The unit features a keyless entry system, so you do not need to keep track of a key while lounging on the beach or at the pool! The condo is in building number five, one of the most sought after buildings in the complex. You are close to everything in the complex, but far from the road noise. This beautiful unit has a view of the pool and the central garden area straight through the whole complex. 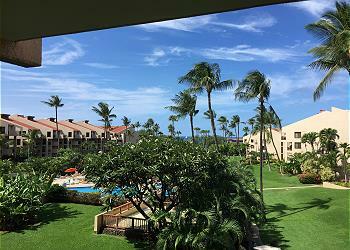 Kamaole Sands has well maintained lush gardens, fountains, and tropical birds. It is directly across the street from the world renowned Kamaole Beaches. The resort also features a beautiful swimming pool, two Jacuzzis, children’s pool, four tennis courts and a fitness center all in a tropical garden setting. Enjoy upscale shopping and restaurants at The Shops at Wailea or many of the local stores in Kihei. The Wailea/Makena Golf Courses are just minutes away. There is a $35 resort fee that is collected by the resort upon check in.